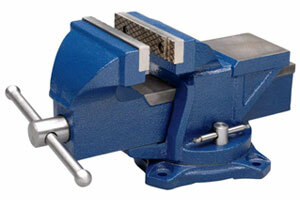 The best bench vise for your garage or shop will be a well-machined tool. Almost all vises (or vices) will have a rotating base that will allow you to swivel the jaws for gripping items from more than one horizontal direction. Having an anvil table built into the vise is also a convenient benefit, and all of the top rated vises will have one. Keep in mind that most vises are not designed for fine detail and don’t provide a method of accurately adjusting the grip tightness. Some models may include rubber jaw coverings to reduce slippage, but this isn’t a common feature. Other heavy duty vises may have a rotating head with various locking positions and even reversible jaws for more flexibility. Yost 455 5.0" 5.5" 3.3"
Yost 750-DI 5.0" 5.0" 4.0"
Tekton 54004 3.0" 4.0" 2.1"
Yost ADI-6 7.9" 6.0" 3.7"
Irwin Tools 4935505 4.9" 5.0" 3.0"
Wilton 14500 6.0" 5.5" 3.8"
Grizzly G7062 5.0" 5.0" 3.0"
Wilton 11104 4.0" 4.0" 2.3"
Yost LV-4 3.0" 4.5" 2.4"
What Size Bench Vise Should I Get? How Do You Mount a Bench Vise? What are Some Common Bench Vise Uses? Made from a combination of cast iron and steel, this popular vise has a large anvil work surface and 360 degree swivel base, making it the perfect tool for a wide range of clamping jobs. Diamond serrated machinist jaws and cast in place pipe jaws keep superior grip, while the steel U channel bar provides increased durability. Also available in 4.5″, 6″, 6.5″, and 8″ variations, this particular configuration has a 5.5″ jaw width, 5″ jaw opening, and 3.25″ throat depth. At 29 lbs., it’s more solid than some cheaper models but easier to mount than larger heavy duty models. The addition of swivel locks has made this vise much easier to use and holds it securely in place. 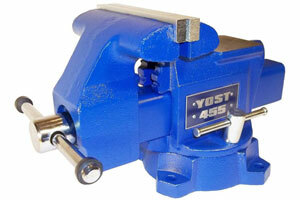 Owners of the 455 recommend it as an excellent medium duty vise and perfect for home use. They also suggest greasing the screw prior to mounting for a much smoother clamp. A few owners have encountered problems with the swivel base, from issues turning to the base breaking over time. A few have also complained that the steel components are softer than they expected. But overall, the vise is well-built and arguably the best bench vise for the money. This rotating vise is made of heavy duty 60,000 PSI ductile iron (2x stronger than cast iron), giving it an impressive 9,000 PSI of clamping force. A hardened steel pin helps lock the jaws in place, making it easier to rotate than with a locking nut. The 5 inch serrated jaws are also made of hardened steel for a more durable gripping surface. The jaws open a full 5 inches with a 4 inch throat depth. The 750-DI handles pipes from 1/8″ to 3-1/2″ with its self-align pipe jaws which provide more contact points than the competition for stronger clamping with less marring. Despite being described as a heavy-duty and even industrial strength vise, it has proven to be a great medium duty vise for workshop and home garage use. The double axis rotation makes positioning even easier, while the toothed swivel base locks securely. Because of its weight (63 pounds), the swivel base can be a bit of a pain to turn sometimes. Many customers have also complained about the finish, citing chipped or uneven coverage upon arrival. Unfortunately, this is the case with many heavy items that get shipped but it doesn’t seem to be a regular occurrence. Tekton has really been making a name for themselves in the tool industry over the past few years by offering good quality tools at a price at a price almost consistently lower than the competition. 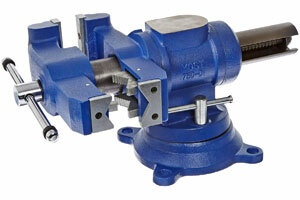 This 4-inch vise is built from 30,000 PSI cast iron and has serrated steel jaws that can be replaced as needed. A 120 degree swivel base with dual lockdown nuts and polished anvil make jobs easier. Turning the handle is almost effortless, and the Acme screw functions smoothly. With a 3-inch jaw opening and 2-1/8 inch throat depth, it’s not going to grip larger items as well as some of the others, but it’s going to handle almost anything the typical homeowner will need it for. Because of its smaller size, it can be mounted in places others can’t making it maybe the best compact bench vise currently available. This is a perfect starter vise for new users and will last a long time. However, be warned the mounting holes are actually slightly smaller than the listed ⅜ inches, so you may need to expand the holes. When you need a heavy duty vise for a low price, the ADI-6 (replacing the FSV-6) is hard to beat. 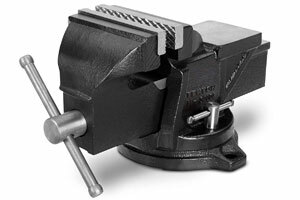 Built from incredibly strong 130,000 PSI tensile strength austempered ductile iron (ADI), this vise is four times stronger than standard cast iron and the strongest bench vise on the market. For being such a heavy duty vise, you’d expect it to weigh 60-70 pounds but instead, it comes in at a surprisingly lightweight 42 pounds. The 6″ wide jaw opens almost 8″ and has a throat capacity of 3.7″ making it possible to grip larger objects than most other models. A large anvil work surface, 360 degree swivel base, and replaceable machinist and pipe jaws mean it’ll be able to fill your needs for many years to come. Thanks to the adjustable guide rails, tasks are smooth and easy. This is an incredibly solid vise with no welds. The base incorporates teeth for a superior lock. 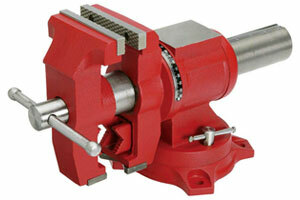 While not essential to its function, owners love how the bright red stands out compared to the usual vise colors. A few people have reported receiving a damaged or defective vise. The coating may also be poor in some cases but it’s possible that was simply due to a bad batch. 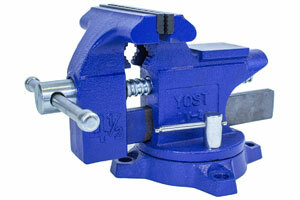 The Yost ADI-6 is just a great, no-nonsense heavy duty vise that will work flawlessly for many years. Made in Taiwan. 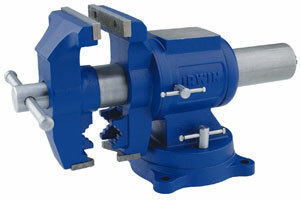 This 5 inch bench vise is solidly built like any other tools that come from Irwin. has a fused steel handle for easier adjustments. The 360 degree swivel base, rotating pipe jaws, and incorporated anvil make a wide range of tasks possible. Weighing in at just over 33 pounds, this cast iron vise is sturdy enough for commercial use but will feel right at home in your garage. We’d put in in the medium-duty category. The vise jaws open just under 5 inches and it has a 3 inch throat depth. With smooth action, well-aligned jaws, and a tight grip, it’s no mystery why this vise is so popular. Note however that there’s been some concern over the long-term durability of this vise, which has hollow cast steel jaws. Thankfully, the one report of a break also confirmed that Irwin stands behind this product and will remedy the situation. While we would hope it’s made in the USA like other Irwin tools, it’s actually made in China but to Irwin’s standards. The Wilton 14500 is built for heavier use than it’s smaller cousin, the 11104 below. In standard configuration, the jaws will give you up to 6 inches of opening, but one of the nice features of the 14500 is that the jaw can be reversed, giving you more than 9 inches of grip when you need it. It also provides two anvil platforms, which can be useful if you use the vise in reversed configuration frequently but still need the anvil surface to be available. As with its little brother, the most serious complaint with the 14500 is that it is not a true American-made tool, but is manufactured in China but to Wilton’s American specifications. The result is that it fits together a little looser than we’d like, and the single-shaft twist adjuster is not as durable as a heavy duty vise would be expected to have. But, if you need a heavy duty vise with a large opening, this one will serve your needs. 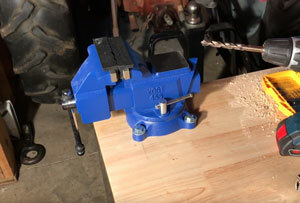 Probably the best reversible bench vise you’ll find. 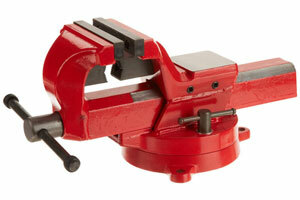 The Grizzly G7062 is an excellent medium-duty bench vise that has two features setting it apart from typical vises. The shaft design provides smooth adjustments and a tighter shaft fit, and it can be swiveled vertically as well as horizontally. This gives you a virtually unlimited variation on the grip direction. Both the jaw opening and width are exactly 5 inches and the vise has a 3 inch throat depth. At almost 50 pounds, it’s a solid piece of equipment. The G7062 also has rubber-coated jaws for gripping material that might be scratched or gouged using a standard solid-metal jaw so it’s great for holding wood while doing some intricate cuts with your coping saw or when cutting soft metals. The main complaint with a Grizzly 7062 is that the vertical swivel is dependent on the jaw to lock it in place. Holding your material in place while you tighten the jaws can be annoying until you get the hang of it. The Grizzly tool company was founded and still manufactures many of their tools in the United States but unfortunately, the vise is made in China (like almost every vise on the market today). The Wilton 11104 will serve you well as one of the better vises for the money. If most of your vise-related needs are situations where you need a third hand for gripping, you’ll love the easy movement and tight grip available from the 11104. The jaws open to a maximum of 4 inches with a 2.3 inch throat depth, so keep this in mind before you purchase. 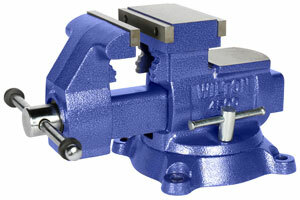 Wilton uses a standard vise construction, with a solid piece of steel for the outer jaw. This makes the vise more stable and greatly reduces the potential for bending or breaking. Unless you need wider jaws or something built for heavy duty gripping, this unit is probably all you will need. Even though Wilton is an American tool company, their bench vise products are actually built in China so keep that in mind if you’re only considering a product made in the USA. The adjusting handle is one of the most common complaints, and may have a tendency to bend under excess force. Another small issue that comes up occasionally is that the vise, being made overseas, is designed to accept metric sized bolts for mounting on your workbench, and standard SAE versions will be too large or small. This isn’t a major problem, but mounting it with the appropriate size bolts will give you more stability. For added protection in shipping, the Wilton 11104 is completely coated in moisture-resistant grease prior to shipping, so be prepared to give it a thorough cleaning before you mount it. If you’re willing to spend a few dollars more, we’d recommend going with something like the Yost 455 or Tekton models above. One of the best-selling bench vises of all time, the Yost LV-4 is cheap (price-wise) and actually works well. Designed for a home workshop, the LV-4 has a 240 degree swivel base and a 4.5 inch jaw width. The cast iron body is painted with a durable blue powder coat, and the jaws are made of quality steel. You can fit pipes with a diameter ranging from .6 inches to 1.85 inches in the built-in pipe jaws, making this a great tool for DIY plumbing and metalworking jobs.. This is an excellent light duty vise and likely the best budget vise you’ll find. The rotation lock is solid, and there’s no slop in the jaws. Owners have used this mostly for home automotive repair, attaching to their reloading bench, or using for other general DIY tasks with great results. There have been several reports of excess slop in the pivot joint. This can be easily fixed, although Yost tends to leave it to the buyer. Also note that this vise isn’t designed for crushing. For infrequent use, this Yost is hard to beat. For regular use, you’ll want to step up to a heavier duty model. There are a lot of vises on the market, which can make purchasing one a confusing task. Thankfully, a couple key considerations can help you greatly narrow down the list to those most suited to your needs. The width of a vise’s jaws dictates the maximum amount of contact that vise will have while gripping. As a general rule, 4 to 5 inch jaws are ideal for home use. This measurement is the vertical distance from the top of the jaws to the top of the slide. It also affects the size of pieces you can work with. When working with three dimensional objects, you’ll want to measure the length between the jaws when fully open, as this dictates the max diameter or thickness of the objects you can hold. Note: These specs for all of our recommended vises are shown in the table at the top of the page. Cutting Conduit – Having a vise to hold electrical conduit steady helps ensure accurate cuts every time. Drilling – Getting those holes precise is so much easier when you have a vise holding the object steady. Gluing – When you need to keep two pieces precisely aligned until the glue dries, there are fewer tools more useful than a good vise. Simply align the glued object in the jaws, tighten to the appropriate pressure, and walk away knowing it won’t be disturbed. Don’t use too much glue as the pressure can make a big mess. Removing dried glue is not fun. Metalworking – A vise makes it incredibly easy to cut or shape a piece of metal, acting as an extra set of hands. Sanding or Planing – Sanding requires an even touch, as does using a good plane. The vise can make these tasks far easier by keeping pieces level and steady. Sawing – Locking wood securely into a vise means you won’t have to worry about it moving during a cut.